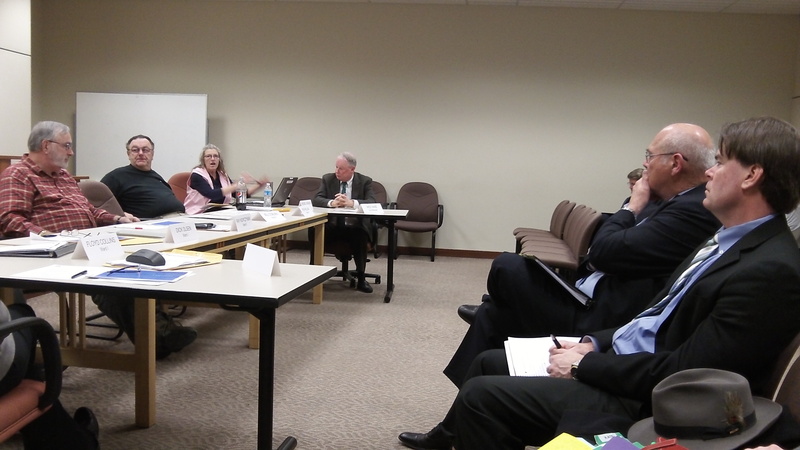 Council members talk with City Attorney Jim Delapoer, second from right, at Monday’s work session. Marijuana was on the minds of the Albany City Council again Monday. I’m speaking figuratively, of course. The mayor and five councilors (Bill Coburn was away) were nothing if not sober at Monday’s work session, where they spent nearly an hour hashing over what the city government might do come March, when the state expects to start licensing medical marijuana dispensaries. You may recall that a few weeks ago, the council voted 4-2 to initiate a change in land use regulations banning any land use or business that is against state or federal law. That would ban medical pot dispensaries, because weed is a federally controlled substance. This change in the development code comes before the planning commission for a public hearing on Jan. 27. Assuming the planners go along, another public hearing will follow before the city council. So they want the city to ban dispensaries. According to lawyers for the legislature, that’s not what lawmakers had in mind when they voted last year to authorize dispensaries. The legislature meets again in February. It could put an end to all this foolishness by amending the law to make clear that if the state licenses a dispensary, local government must not make it impossible. Lawmakers might also take another step: To forestall an initiative legalizing the recreational use of marijuana, they could place their own measure on the ballot in November for the voters to decide. That would save everyone a lot of trouble. If it passes, it would also make moot whatever the Albany council does. Excellent synopsis of the meeting and summation… Thank you! Oregon is one of the 50 states, federal law is supreme over state law, selling 5 lbs of marijuana is a felony under federal law……….. what part of felony do we not understand here? this has nothing to do with medicine, it is illegal, my oath of office states that I will uphold the law…. Then I fully expect to see you out there with law enforcement tracking down illegal immigrants, or arresting doctors assisting in the dignified death of patients, or tracking down and shutting methadone clinics (which is a Schedule II drug and federally illegal), etc etc etc. Enough of the hypocrisy, Kellum. You insult the intelligence of the people who put you in that chair. Whether or not you think marijuana has medical merit is not for YOU to decide (People v. Spark). The US Health and Human Services department (Federal agency) also does not agree with you (US Patent 6630507). With this simple paragraph federal law was superseded in Oregon as well as 21 other states so far. For the body of the city council to attempt to usurp Oregon voters and the Oregon Legislators is opening Pandora’s Box for the City. Federal “occupation of the field” occurs, according to the Court in Pennsylvania v Nelson (1956), when there is “no room” left for state regulation. Courts are to look to the pervasiveness of the federal scheme of regulation, the federal interest at stake, and the danger of frustration of federal goals in making the determination as to whether a challenged state law can stand. The issue: How should courts determine whether a federal law preempts state law? The preemption doctrine derives from the Supremacy Clause of the Constitution which states that the “Constitution and the laws of the United States…shall be the supreme law of the land…anything in the constitutions or laws of any State to the contrary notwithstanding.” This means of course, that any federal law–even a regulation of a federal agency–trumps any conflicting state law. Preemption can be either express or implied. When Congress chooses to expressly preempt state law, the only question for courts becomes determining whether the challenged state law is one that the federal law is intended to preempt. Implied preemption presents more difficult issues, at least when the state law in question does not directly conflict with federal law. The Court then looks beyond the express language of federal statutes to determine whether Congress has “occupied the field” in which the state is attempting to regulate, or whether a state law directly conflicts with federal law, or whether enforcement of the state law might frustrate federal purposes. In April 2010, Arizona’s governor signed legislation making it a crime to be in the state without having obtained lawful entry into the U.S. State police were authorized to demand proof of citizenship for persons they had “reasonable suspicion” to believe were illegal aliens. Illegal entry into the United States, the act punished by the Arizona law, is also “a crime against the nation.” In what ways, if any, do you think immigration enforcement of the sort required by the Arizona law is distinguishable from the subversive advocacy enforcement that the Court found preempted in Pennsylvania v Nelson? In Silkwood v Kerr-McGee (1984), the Court, voting 5-4, found that a $10 million dollar punitive damages award (in a case litigated by famed attorney Gerry Spence) against a nuclear power plant for negligently allowing employee (and union activist) Karen Silkwood to be contaminated with plutonium was not impliedly pre-empted by federal law. Even though the Court had recently held that state regulation of the safety aspects of a federally-licensed nuclear power plant was preempted, the Court drew a different conclusion with respect to Congress’s desire to displace state tort law–even though the tort actions might be premised on a violation of federal safety regulations. Cipollone v Liggett Group (1992) was a closely-watched case concerning the extent of an express preemption provision in two cigarette labeling laws of the 1960s. The case was a wrongful death action brought against tobacco companies on behalf of Rose Cipollone, a lung cancer victim who had started smoking cigarette in the 1940s. The Court considered the preemptive effect on state law of a provision that stated “No requirement based on smoking and health shall be imposed under state law with respect to the advertising and promotion of cigarettes.” The Court concluded that several types of state tort actions were preempted by the provision, but allowed other types to go forward. Perhaps the most interesting aspect of the case, from a constitutional standpoint, is the debate between justices over whether express preemption provisions should be read narrowly (a view adopted by seven justices) or read normally (a view favored by Justices Thomas and Scalia). Gonzales v Oregon (2006) considered whether Congress, in enacting the Controlled Substances Act, intended to pre-empt state laws such as that of Oregon’s which authorized physicians (under strictly controlled circumstances) to prescribe lethal doses of controlled drugs for terminally ill patients. (The case also raised the administrative law issue of whether the Attorney General acted within the scope of his statutory authority when he issued regulations criminalizing the prescription of lethal drugs by physicians.) The Court, ruling 5 to 4, held that the Act did not authorize pre-emption of Oregon’s Death with Dignity Act.